In order to better development of the water treatment industry and meet clients’ requirements, IROCHEM has manufactured a series of new products. Such as ATMP, HEDP, EDTMP, DTPMP, PBTCA, HPAA, PAPE and PAPEMP. However, the study of organic phosphine inhibitors continues to develop. There are a lot of reports about organic phosphonic antiscale and corrosion inhibitors in China every year. Because of the kind of corrosion inhibitors have so many functions, such as scale inhibition, corrosion inhibition, antifreeze, and lubrication. They are getting more and more attention. IROCHEM’s other organic phosphonic antiscale and corrosion inhibitors also have the advantages of high efficiency and good stability. The main types are polyamide, polyacrylic acid, polyether, and other phosphorous polymers. Scale inhibitor is composed of organic phosphine, fine copolymer and copper corrosion inhibitor. They have excellent corrosion resistance to carbon steel, COP and copper alloys. And these scale inhibitors have good dispersion properties of calcium carbonate and calcium phosphate. IROCHEM’s scale and corrosion inhibitors are mainly used for the open circulating cooling water treatment system, especially for copper equipment system. HEDP can be used for high pH, high alkalinity and high hardness of water quality. It is one of the ideal non-ph alkaline treatment water treatment agents. HEDP accounts for a large proportion of all organophosphate corrosion inhibitor products. HEDP is also one of IROCHEM’s main products. It is well known that HEDP is an organic phosphonic acid scale inhibitor. It can form a stable complex with metal ions such as iron, copper, and zinc. HEDP can remove and reduce metal ions in water very well. HEDP can dissolve the oxide on the metal surface. It is still under 250 ℃ can play a role of good scale and corrosion inhibitor. Its acid and alkali resistance and chlorine oxidation are better than other organic phosphonic acids (salt) products. HEDP can form six ring chelates in water with metal ions, especially calcium ions. The results show that the six ring chelates have a good effect of scale inhibition and obvious dissolution. When combined with other water treatment agents, the siX-ring chelate has the ideal synergistic effect. 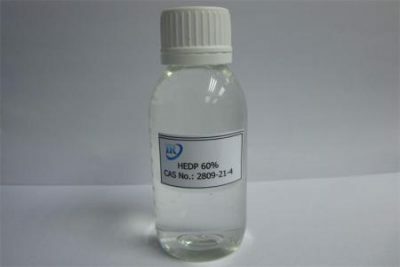 HEDP is not easy to hydrolyze and remains stable under high pH. HEDP is not easy to decompose under normal photothermal conditions. It is important to note that only high-purity solid HEDP products are suitable for use in cold winter areas. This solid HEDP is especially suitable for cleaning agents and daily chemical additives in the electronics industry.